Notes: Landskrona Citadel (Swedish: Citadellet or Landskrona slott) is situated in Landskrona, Scania, southern Sweden. 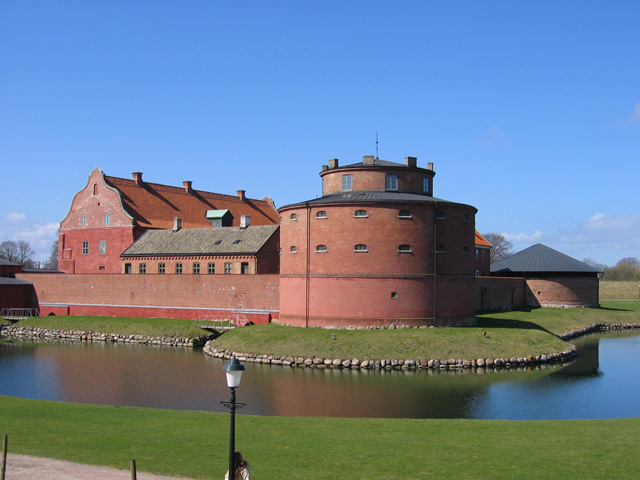 Its entirety including the very well-preserved moat system, the castle, park and old allotment areas, and central as well as sea-side location makes Landskrona Citadel unique. Initially built 1549-1559 as a purely defensive fortification with two complete moats, the inner with a width of 70 metres (230 ft). The outer (complete) moat is between 40 and 70 metres (130 and 230 ft) wide, and has cross fire bastions for artillery and guns. Outside the outer moat, a third narrower moat covers the northwest and northeast. There also exist remains of a fourth moat (between the two outer moats). The fortifications and moats system surrounding the castle is known to be one of Europe's largest and best preserved. In the area between the outer and far outer moat resides the oldest area of allotment-garden cottages of Sweden. It was captured in 1644 by forces led by Gustav Horn, but returned to Danish possession the year after. It became Swedish again in 1658 as a result of the Treaty of Roskilde. Between 1667 and 1675, the citadel was expanded with extensive bastions. Thus on 2 August 1676, during a new war between Sweden and Denmark, the commandant Hieronymus Lindeberg surrendered himself and the castle to a Danish army unit. Until peace was restored in 1679, the castle was used as a center of command by the Scanian voluntary army corps ("Friskydter" in Danish-Scanian history, "Snapphanar" in Swedish) which fought together with the regular Danish army against the Swedish occupiers. Lindeberg survived the Danes but was later executed on order of Swedish king Charles XI ("Karl XI"). In the middle of the 18th century, the local military commander feared (quite suddenly) that the 15th century church Johannes Babtist Kyrka ("John the Baptist church"), which at the time was the second largest in Scania, must be destroyed. The reason was a fear for enemy canons in the church tower. The whole church was demolished and a new one, Sofia Albertina, was built some decades later. The castle was used as a women's prison from the late 19th century and some decades later. Today the castle is both a kind of museum (guided tours only, but not expensive, daily during the summer) and can be rented for private parties.